We know that fiber optic connector plays an important role in connecting optical cable with other optical components. As an indispensable component in cable installation, the cleanliness of fiber optic connector needs attention. Since it is impossible to guarantee that fiber optic connector does not get dirty, do not forget to clean the fiber optic connector. 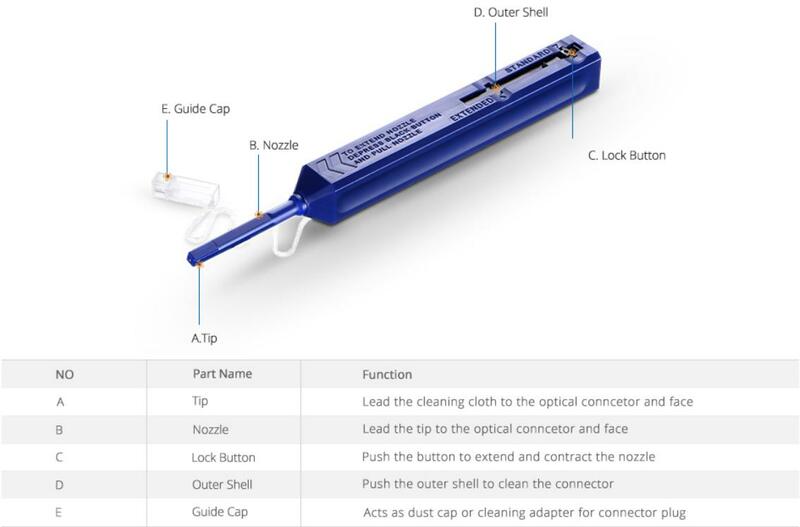 This article is going to introduce two tools for your fiber optic connector cleaning—one-click cleaner and cassette cleaner. Both of one-click cleaner and cassette cleaner utilize dry cleaning without any alcohol and other harsh chemicals. However, the one-click cleaner is applicable for cleaning both connector in adapter and exposed connector with one-push action, while the cassette cleaner is only applicable for exposed connector. In addition, one-click cleaner has three types for LC/MU, SC/ST/FC and MTP/MPO connector respectively, while cassette cleaner is used for MTP apc connector or MPO apc connector. In the following part, the cleaning procedures of them will be shown. The structure and procedures of these two types of one-click cleaner are similar, so take 1.25mm one-click cleaner for example. Insert the cleaning tool into the bulkhead and turn the cleaning wheel backwards until click two times. Carefully pull out the guide cap cover. Insert the patch cord into the cleaning tool, apply slight pressure and turn the cleaning wheel backward until click two times. Select the appropriate cleaner for male/female. For MTP female connector or MPO female connector, use the cleaning brush and fluid to remove any debris from the pin holes. Depress the lever so that a fresh area of cleaning cloth is exposed. Position the ferrule against the cloth so that the fibers are in contact with the cleaning material. In the case of angled connectors, the ferrule will need to be adjusted accordingly. Wipe the connector in the direction shown on the cassette. Release the grip to seal off the cleaning cloth. Let the ferrule air-dry before inspecting with a 200xmicroscope. If still contaminated repeat all steps once again. Ensure that the connector does not touch any hard surfaces. Note: Do not move connector back and forth. Connector is to be moved in only the direction of the arrows on the cleaner. To ensure high level optical performance, it is critical to keep fiber optic connector clean and free of contaminants. One-click cleaner and cassette cleaner are being highly recommended as practical tools for cleaning optical fiber end-face without the use of alcohol. We know that the interface of each fiber optic component should be kept clean because dirt and dust can completely obscure the light wavelength and affect the network performance. For fiber optic connector, which plays an important role in a complete optical link, it is impossible to ensure that it does not get dirty. Therefore, cleaning connector is a key task. This post is going to introduce a practical tool for cleaning connector to you—one-click cleaner as well as how to use it. 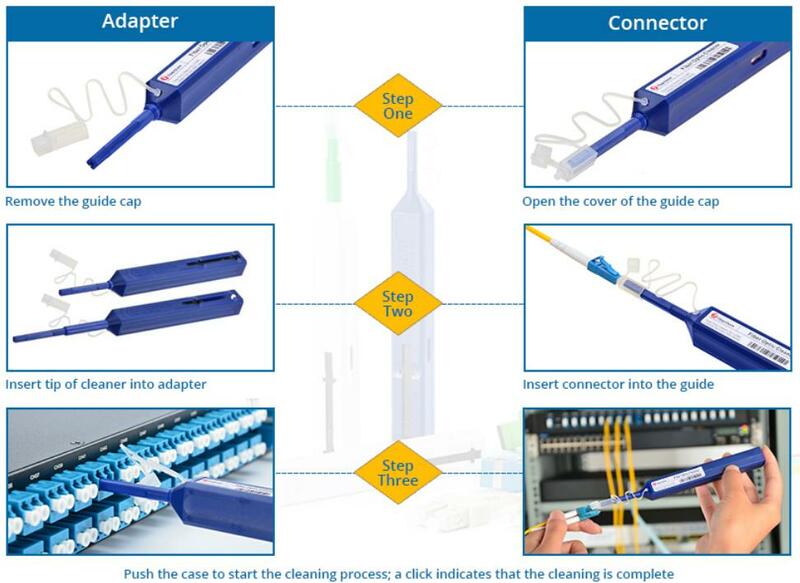 The one-click cleaner is applicable for cleaning both connectors and adapters with one-push action. It utilizes dry cleaning without any alcohol and other harsh chemicals. In addition, the one-click cleaner uses the mechanical push action to advance an optical grade cleaning tape while the cleaning tip is rotated to ensure the fiber end-face is effectively, but gently cleaned. Simply insert the one-click cleaner into the connector or the adapter and push until you hear an audible “click”. According to different types of fiber optic connectors, there are three types of one-click cleaners—1.25mm LC/MU one-click cleaner, 2.5mm SC/ST/FC one-click cleaner and MTP/MPO one-click cleaner. The following part will focus on their structures and usages. 1.25mm one-click cleaner is an easy-to-use option for cleaning MU and LC connectors and exposed 1.25mm ferrules, while 2.5mm one-click cleaner is designed to clean SC, ST and FC connectors and exposed 2.5mm ferrules. The structure and usage of these two types of one-click cleaner are similar, so this part will only take 1.25mm one-click cleaner for example. As for the structure of 1.25mm LC/MU one-click cleaner, it can be divided into five parts—tip, nozzle, lock button, outer shell and guide cap. Tip is used to lead the cleaning cloth to the fiber optic connector and face; nozzle is used to lead the tip to the fiber optic connector and face; lock button is used to extend and contract the nozzle; outer shell is used to clean the fiber optic connector; guide cap acts as dust cap or cleaning adapter for connector plug. To have a better understanding of the structure of one-click cleaner and the function of each part, here is a figure for you. Since one-click cleaner can be used to clean both connectors and adapters whose interfaces are different, the operation methods of different applications are different. 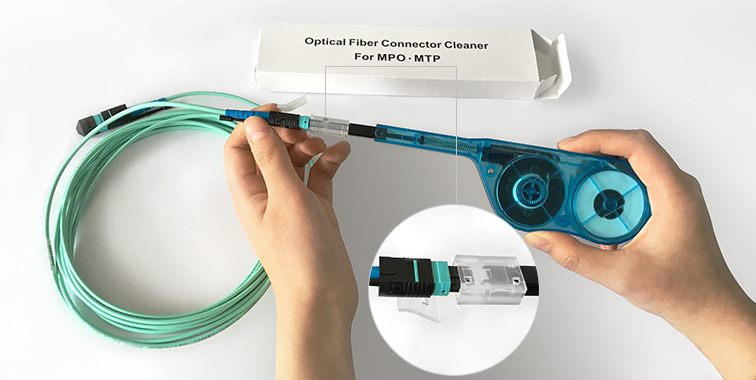 MTP/MPO one-click cleaner uses the innovative push-to-clean design for cleaning MTP/MPO fiber connector used in data centers and other high density optical networks, which simplifies the cleaning of the ferrule end-face of MTP/MPO fiber connector. The mechanical push action advances the optical grade cleaning tape while effectively and gently cleaning the end-face of the MTP/MPO fiber connector. The following figure shows the structure of MTP/MPO one-click cleaner. Tip is used to lead the cleaning cloth to the fiber optic connector and face; guide cap is used or cleaning connector; guide cap cover protects cleaner from dust; cleaning wheel has several rounds of linear polyester used for cleaning. In order to get high level optical performance, it is imperative that fiber optic connections are clean and free of contaminants. Fiber optic cleaning product is being highly recommended as a kind of very important tool for data center cabling. One-click cleaner is a practical tool for cleaning fiber end-face without the use of alcohol and it can be used for about 600 to 800 times. It is really a cost-effective solution for fiber optic connector cleaning.